Keith Jarrett (born May 8, 1945 in Allentown, Pennsylvania, USA) is an American pianist and composer. He is considered one of the most important jazz pianists, renowned for his elaborate solo improvisations. 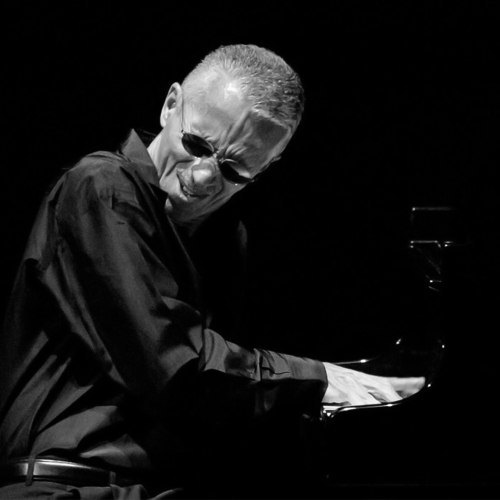 As well as recording under his own name, he has recorded a number of albums as the Keith Jarrett Trio. In 2003, Jarrett received the Polar Music Prize, the first (and to this day only) recipient not to share the prize with a co-recipient, and in 2004 he received the Léonie Sonning Music Prize. Jarrett began piano lessons at the age of two and played for the first time on stage at the age of seven. In 1962 he played a self-composed two-hour concert, without the benefit of any prior formal instruction in orchestration or composition. After working with a wide variety of musicians, beginning in 1966, including Chet Baker, Lee Konitz and Art Blakey, he founded his own band in 1968 with Charlie Haden and Paul Motian. In 1971-76 Dewey Redman (saxophone) joined the group and they played under the name of the "American Quartet". His work with Miles Davis between 1969 and 1971 gave his career an additional boost, as well as the opportunity to play solo concerts such as the "Köln Concert" (1975, Cologne, Germany), honoured by Time Magazine as album of the year. Since the early 1970s, he has enjoyed a great deal of success, both artistic and commercial, in both classical and jazz music as a group leader and a solo performer. His improvisation technique combines jazz, classical, gospel, blues, and various ethnic-folk musics. He is considered by some, to be the "Bach" of jazz music; this title may have come from his recording of Bach's Goldberg Variations, which, although it received many awards, was not entirely approved by critics. In the 1990s he suffered chronic fatigue syndrome only to take up the piano again in 1998. He worked in a trio form with Gary Peacock and Jack DeJohnette until 2014. Jarrett stated in a 2005 TV interview that his music is influenced by the teachings and philosophy of Georges I. Gurdjieff, whom he honoured in "Sacred Hymns" (ECM, 1980). This philosophy informs many of his non-musical beliefs as well. In 2008, he was inducted into the Down Beat Hall of Fame in the magazine's 73rd annual readers' poll. In 2010, to coincide with his 65th birthday he released his first studio album in 12 years - Jasmine. It reunited Jarrett with his old bassist colleague Charlie Haden; the two had not recorded together for over 30 years.